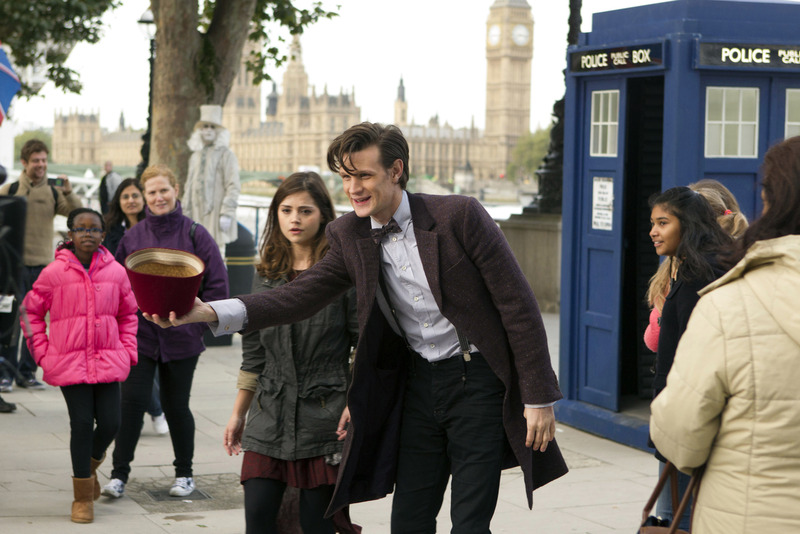 The weight of expectation on this episode was considerable; not just the season premiere but the premiere of Doctor Who’s 50th anniversary season. Not just a story that introduces a new companion but a story that introduces a new companion for the third time. If that last sentence confuses you, then welcome to the timey-wimey word of Steven Moffat’s Doctor Who. But in fact most of this story was designed not for uber-fans but for casual viewers – a relatively simple story of something nasty lurking in the wifi, uploading human beings’ consciousness in a high tech operation run out of the Shard by Celia Imrie, stroking her IPad like Blofeld strokes his cat. Billed as a Skyfall-inspired urban thriller, this was a show with some casually expensive shots (trips to Paris, Tokyo and San Francisco in the pre-credit sequence, a crash sequence with a Boeing 737) mixed with some beautifully judged moments of suburban humdrum. If the most unlikely thing was a London barista over the age of 30 then that’s only because the sequence of a motorcycle riding up the Shard was so wonderfully well realised. Quite why the Bond villain is unleashing a deadly wifi plan we never really found out. There is, or may be, an ongoing arc with Richard E Grant. We’ll have to hope it works out better than series 6 when a gang of aliens decided the best way to kill the Doctor was to genetically engineer a woman and develop the space race so they could put her in a space suit at the bottom of a lake ready to wade out and shoot him… Or something like that. For once, the deadly alien menace isn’t the main focus of the story. This time around the main interest is Clara, the girl for whom we’ve been waiting, as she manages to live out the end credits and join the Doctor on his travels. Maybe familiarity disappoints, but for my money this was the least impressive of Jenna-Louise Coleman’s outings so far. She just slightly lacked the fast witted banter of, Daleks Clara and the Mary Poppins primness of Snowmen Clara. Matt Smith, however, remains ineffably brilliant; the slightly crazed Wonka-esque nature of his Doctor accentuated by a new costume. A small moment in a small scene, his “I invented the quadricycle” line was just amazing. Let’s hope that the screwball chemistry which we’ve previously witnessed between the leads bursts into bloom again in the rest of the series run. The use of the Fez and a plate of Jammie Dodgers served to remind us just how brilliant and unique Mat’s take on the Doctor is. He’s in imperious command of the character and the forthcoming anniversary special with David Tennant promises to be a glorious treat. If the script uses some broadly familiar Moffat tropes (characters switching in and out of some unseen controller’s voices) it also managed to feel like a Russell T Davies modern day earth under attack effort (complete with secret alien HQ in major London landmark). There’s ben criticism elsewhere that the story felt familiar – well I’d argue that simply means that twenty-first century has found a voice of its own. The rest of the cast are given little chance to shine with Celia Imrie and Robert Whitlock reduced to pretty broad stereotypes as Evil Villain and Henchman, but Colm McCarthy emerged with considerable credit as director: the sequence where the TARDIS takes off and lands on the crashing aeroplane was handled with considerable aplomb. 2013 promises to be a breakthrough year for McCarthy as he tackles another episode of Endeavour and steps up to the plate with a segment of Sherlock. Indeed, “one to keep your eye on” could prove to be a leitmotif for this story. The Great Intelligence, Clara, the leaf and the woman in the shop. Doctor Who‘s back. And it’s not a moment too soon.